Whenever I feel stressed, I drive to my farmlands with my family. One is quite far, about six hours drive, and the other is a short one of only 15 minutes ride from my house. I enjoy visiting farmlands. Is it because I am getting old? Probably not! It is just because my fellow people enjoy escaping from their day-to-day hard works. I love eating at farmlands. Everything they cook taste delicious compared to what we cook in my house. However, vegetables, meats, and eggs, in farmlands are not as fresh as you may think. According to the caretakers of the farmlands, they were harvested several days ago. If so, why is it that their meals taste much better? One time, I invited the family living in the farmland to come over to my house in the city for vacation. In the morning, our breakfast was with sunny-side up eggs. The caretaker used eggs bought at our local supermarket. Amazingly, its taste was the same as I experienced in my farmland. Wow, how could that be!? What made the domestic eggs taste so delicious? There must be some magic somewhere, so I tried to find out how my visitor cooked the egg. Yes, you may know how to cook sunny-side up eggs, but you may not know how to actually cook it perfectly or properly. Sunny side-up eggs come in so many varieties. Hard cook...medium cook...soft cook...whichever they are, some tastes good and some don't. Some say that it depends on the kind of egg. What is right and what is wrong? 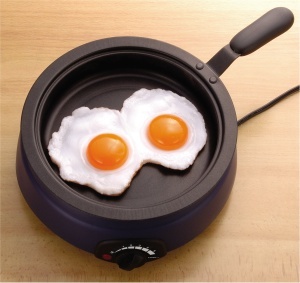 You will be surprised to know that there is a technique in cooking sunny-side up egg properly. You might think that I'm kidding. But I'm not. Does it have anything to do with the strength of the flame—high, medium, or low flame? No, no, no. It all starts on how you break the egg. Yes, there's actually a technique in breaking the egg. The egg cell is very sensitively made. Its structure can be easily collapsed by simple shock. Once the cell structure collapses, then its taste will also degrade and change. It is the reason that almost all sunny-side up eggs have different taste. Break the egg with the edge of knife or spoon to prevent destroying the egg cell structure, and to avoid strong shock to the egg cell. Do not drop the egg yolk from a high distance. Drop it only at about 1 inch (3 centimeters) high to avoid breaking the yolk structure. As you can see from the video, the egg is tenderly cracked on a saucer at a distance of about 1 inch (3 cm). In this way, the cell structure of the yolk remains intact. Scoop the yolk with a tablespoon and place it on the frying pan. After a few seconds, when the bottom of the yolk is slightly cooked, pour the egg whites to the surrounding of the yolk. Cover the frying pan and cook until your desired doneness—hard cook, medium cook, or soft cook. Isn't that simple? Yet, the taste will be greatly improved. You will feel as if your eating habit had changed instantly. 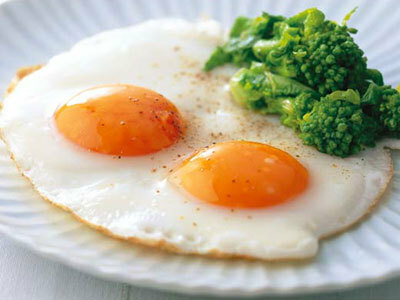 TRIVIA: One medium-sized egg has about 76 calories. You can burn 76 calories by 30 minutes of walking, or 15 minutes of jogging, or 25 minutes of biking. A simple daily observation in living can improve your life and find a new life for good health as well as new invention. Good luck!